HOUSTON -- Efforts to clean up one of the nation's busiest seaports after a collision between two vessels on the Houston Ship Channel spilled a flammable chemical were expected to take at least several days, U.S. Coast Guard officials said Tuesday. About a 4-mile to 8-mile stretch of the ship channel remained closed as crews worked to deal with the gasoline additive that spilled after two 600-foot ships collided on Monday in foggy conditions. U.S. Coast Guard Capt. 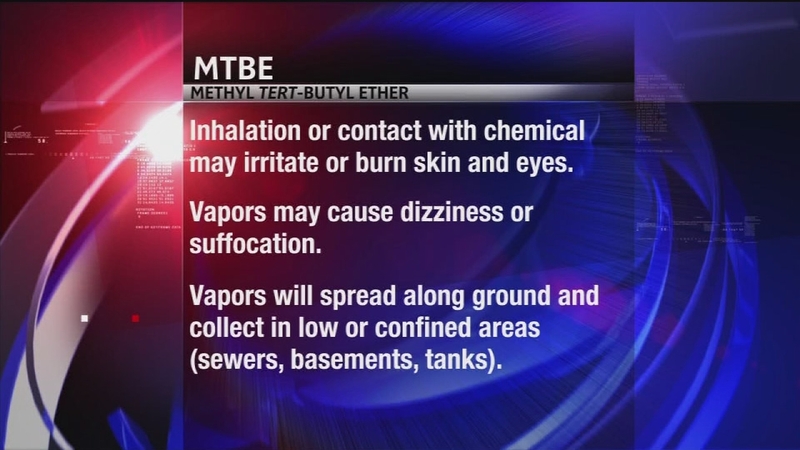 Brian Penoyer said the immediate goal is ensuring that there is no danger from the spilled additive - methyl tert-butyl ether or MTBE - as it is highly flammable and can be dangerous to people if inhaled in high doses. No injuries were reported from the collision. Three cargo tanks of the chemical on the Danish-flagged Carla Maersk were ruptured when it collided with the Liberian bulk carrier Conti Peridot. A cause of the collision has not been determined. The Carla Maersk, which remains in the channel, was carrying approximately 216,000 barrels of MTBE before the collision but officials were still trying to determine how much had been spilled. "We have to proceed step by step, making sure the flammability, the toxicity of this cargo is absolutely safe," said Penoyer, commander of the Houston-Galveston Coast Guard District. "We need to recognize this is an enormously complex salvage operation. ... We are driven by factors on the ground, not by a desired time frame. We all live here. We want to get back to business as usual. But we have to make sure people are safe." Penoyer said officials have found no detectable concentrations of MTBE in the air in the shoreline communities around the spill since about midnight Monday and no sheens of the chemical have been found on the water. "This indicates to us the risk to the public from toxic vapors or flammability of this cargo is virtually nil," he said. There were no shelter-in-place orders on Tuesday for communities near the 50-mile channel that connects the Gulf of Mexico to the Port of Houston. However, there was limited access into the Morgan's Point area, a city of about 350 residents located 30 miles east of Houston and adjacent to Galveston Bay at the entry point to the ship channel. The limited access included the area around Barbours Cut Container Terminal on the ship channel and at least one road into Morgan's Point, said Jeff Suggs, emergency management coordinator for the nearby city of La Porte. The financial impact of the closure of the ship channel was not immediately known. But the Barbours Cut Container Terminal, run by the Port of Houston Authority, was closed on Tuesday due to the cleanup efforts. On Tuesday, there were 28 ships waiting to go into the Houston Ship Channel and 24 waiting to come out, said Coast Guard Petty Officer Andy Kendrick. Officials were also working to determine what kind of impact the spill might have on wildlife by taking and testing water samples, Penoyer said. The Texas Parks and Wildlife Department and other agencies were helping with this effort.